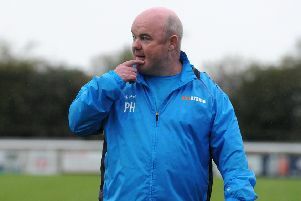 Hamstrung by Connor Gudger and Jamie Hood’s suspensions and the unavailability of Joe Clarke and Reece Flanagan, Paul Holleran’s squad was almost down to the bare bones, but those available to him gave every ounce as they added another digit to their National League North tally. Brakes got off to the best possible start after just three minutes, but not before Junior English was required to get a vital foot in to deny Gavin Allott an almost certain goal. Leamington moved upfield and won their first corner, Dunbar delivering into the six-yard box where Colby Bishop, who spent a seven-game goalless spell with the Pilgrims in 2014 prior to joining Leamington, met the ball with a glancing header which a defender and the goalkeeper were unable to keep out on the line. Leamington were dealt a blow with just eight minutes played when Dunbar, clearly struggling, had to be replaced by Connor Taylor. Bishop headed down at the near post from Jordan Murphy’s right-wing corner, while James Mace was forced to concede a soft corner from which Ryan Qualter headed just wide. The same player headed narrowly off target from the opposite side and his next effort was cleared off the line by a combination of Tony Breeden and James Bowen. Bishop engineered another opportunity for himself inside the box when he turned two defenders but his shot was blocked. The ball was then thumped back in towards goal low by Murphy, Bishop connecting first time and sending it flying just past the post. Jack Edwards had the ball in the net only for an offside flag to cut short celebrations. Qualter fashioned another chance as Brakes failed to clear their lines, stepping inside a tangle of bodies to drive low towards goal but straight at Breeden. Edwards responded with an effort from distance which was fielded by Boston stopper George Willis. Boston were deservedly level in the 36th minute after Bowen lunged in on Max Wright on the edge of the box, Ben Davies sending Breeden the wrong way from the spot. Jay Rollins’ overhead effort inside the box was well blocked by Mace, the same player heading wide as the ball was delivered in from the left. Boston’s tails were up now and Allott forced a fine full-length save from Breeden with a powerful header and was then denied by Mace as he looked to connect with another cross from the right. Rollins then thought he had put the home side in front but he too was thwarted by a raised flag. The aerial bombardment resumed in the second half, Wafula delivering a cross for Rollins to head just past the post. In their next foray, Mace produced a superb challenge to deny Allott, the home fans screaming for another penalty. Taylor then saw a first-time volley blocked as Brakes won their first corner of the half, thumping another well-struck effort into the side netting. The hosts were inches from hitting the front when Rollins got in behind the defence and looked to have beaten Breeden only for the ball to hit the inside of the post and roll into the grateful arms of the skipper. The number ten then beat two defenders before his effort was beaten away for a corner. Craig Elliott introduced all three substitutes as Boston continued to press and the final 20 minutes were a real backs to the wall effort from Leamington. Jack Lane got a superb challenge in to deny Allott with the home fans screaming for a spot kick once more, while Breeden was alert to deny substitute Nicky Walker and then to tip Lewis Gibbens’ header over the bar. Brakes were able to break forward and eat up some valuable seconds in injury time, earning warm applause from the travelling faithful at the final whistle, fully appreciative of the effort put in. Boston United: George Willis, Ben Davies, Ashley Jackson, Andi Thanoj, Lewis Gibbens, Ryan Qualter, Max Wright, Brad Abbott (Spencer Harris, 66), Gavin Allott, Jay Rollins (Jordan Slew, 86), Jonathan Wafula (Nicky Walker, 77). Subs not used: Callum Chettle, Andre Johnson. Brakes: Tony Breeden, Junior English, James Bowen, Jack Edwards, James Mace, Jack Lane, Kieran Dunbar (Connor Taylor, 8), Callum Gittings, Colby Bishop, Jordan Murphy, Ahmed Obeng. Subs not used: Tom James, Martyn Naylor, Ben Newey.